Have you had one of these Starbucks cake pops yet? Only $1.50 and less than 200 calories. Yes, please! Birthday cake, the pink pop in the center, is my favorite flavor from Starbucks. When I brought a selection of all three flavors (Rocky Road, Birthday Cake and Teramusiu) back to my office, my coworkers went crazy over them. This led us to Google "receipes for Starbucks cake pops." Our Google search yielded this recipe by the author of Single Working Housewife . 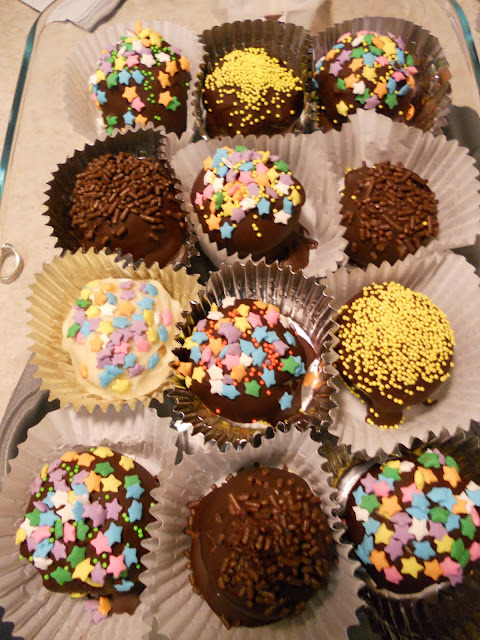 Because I did not have lollipop sticks, I decided to forgo the "pop" concept and try my hand at cake balls. I was surprised how simple the recipe appeared. While I learned the recipe is pretty simple, it does take a lot of time. Step 3: Melt icing in microwave for 20 seconds (until "melty"). Stir icing into crumbled cake bowl. A special thanks to my Aunt April and cousin, Betsy, for joining the cake ball-making party! You need to try red velvet cake with cream cheese icing covered in white chocolate. Amazing! These look great! Cake pops frustrate me, too, so I'll have to try these.